(NaturalNews) Professional athletes who rely on popular sports drinks like Gatorade and Powerade are really doing themselves a disservice, impairing their performance potential. Once in the body, these dye-filled "Kool-Aid-like" drinks actually acidify the cellular environment, restricting oxygenation of cells while limiting ATP energy production from the mitochondria. Still, drinks like these are promoted by athletes and marketed as replenishing sports beverages that enhance athletic performance. 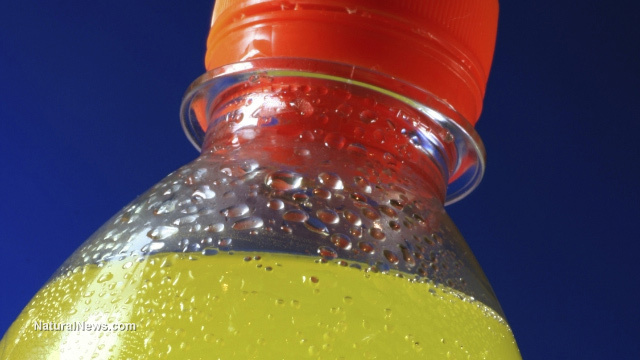 According to a new report by UC Berkeley, these sports drinks aren't much different from soda. After exploring their sugar content and related health risks, the researchers described the beverages as "essentially sodas without the carbonation." In the study, 21 popular drinks with health claims were investigated, as researchers compared flowery marketing with the drinks' actual compositions. "We often see labels on energy and sports drinks that tout health benefits, but the sugar levels in these products rival that of sodas," said lead author Patricia Crawford, director of the Atkins Center for Weight and Health. "They are essentially sodas without the carbonation, but they give the misleading impression that they are healthy," she said. The beverage industry tries to convince the public that drinks like these are healthy, but they are often loaded with sugar; in one drink, there were 18 teaspoons of sugar in the container. Other drinks are fortified with vitamins, but these often go unused by the body, because they are often synthetic derivatives that aren't readily broken down, absorbed and utilized by the body. Vitamin and herb content of some of these energy drinks fools some people into thinking that they are getting a fair share of nutrition for the day, when in reality, they are being inundated with nothing but loads of refined sugar that acidify the cells. The researchers concluded that common sports drinks on the market are also contributing to diabetes and obesity in youth, because they contain so much added sugar. Energy drinks provide short-term energy with heightened caffeine levels, but that energy is quickly lost, addicting youth to want more of the beverages which give nothing but headaches and heart arrhythmia. A true energy drink is simply fresh fruit and vegetable juice, which neutralizes excess hydrogen in the cells as it enters the body. The OH- molecules from the juice combine with excess hydrogen in the acidic environment to form water (H2O); thus flushing the cells, reducing edema and allowing mitochondria to produce more longer-lasting ATP energy. A marketing analysis conducted at Yale University's Rudd Center picked apart the beverages' marketing claims and refuted them here in a simple, straightforward chart. For example, the researchers showed that Gatorade G Series Recover is marketed as "providing hydration and muscle-recovery benefits with its specially designed protein replenishment formula," but the researchers refuted, saying, "Water is the optimal beverage of choice for hydration. The average diet is already high in protein and adequately supports physically active adolescents' muscle rebuilding and growth." Energy drinks like the popular "RockStar" claim that the beverages are "Double Strength, Double Size. Bigger. Better. Faster. Stronger," but according to the researchers, the level of caffeine and guarana in these beverages "stimulate the cardiovascular and nervous system, and can have detrimental effects (such as tachycardia)." On top of that, the researchers correlated energy drinks with increased stress, nervousness, anxiety, headaches, insomnia and reduced academic performance. They were even found to cause hallucinations, tremors and seizures. In fact, the researchers found that all the drinks have one thing in common: explicit sugar content. Anything from popular fruit drinks to flavored water and from sports drinks to flavored teas all contained deleterious amounts of sugar and were determined to be fueling the increase of obesity and diabetes in today's culture.